I'm BAA-AACK! After a month and a half hiatus, I decided it was high time that I rebooted the Mosaic a Day project. 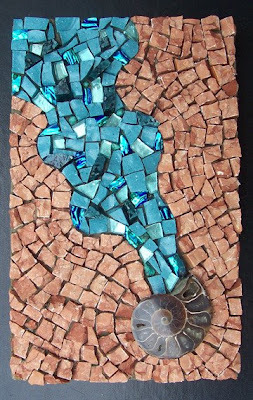 Having said that, I plan on downsizing to four mosaics a week for the next couple of months. Canadian summers are so short that I have to enjoy it while I can. I will also be working on converting the garage into a teaching studio in August, so I expect that will eat up an extra chunk of time as well. I don't know if I've mentioned it, but turquoise and red is probably my favorite color combo in the world.